Precious metals were able to add some value today, but the week as a whole has not been very beneficial. Once again, precious metals are suffering from a marketplace that is mostly devoid of fresh economic data. The market has had time to focus on other things, however, including Janet Yellen’s address to Congress regarding monetary policy and the condition of the US economy. If you are wondering why things are especially quiet this week, look no further than the fact that much of Asia is celebrating the Lunar New Year. While the lack of activity from Asia is having a negative affect on the market, the fact that the Lunar New Year is a time of gift-giving has given metals a bit of a boost. This week marks one of two times during the year during which the chairperson of the Federal Reserve is tasked with explaining the financial situation of the United States as well as what the future holds for the US economy to Congress. Yesterday, in Day 1 of her comments to Congress, Janet Yellen, Fed chairperson, made it very clear that while the US economy continues to improve, the Fed is in no rush to raise interest rates. Instead, she maintained that the interest rate discussion will take place on a “meeting-to-meeting” basis. For investors, this is more or less exactly what was expected from Ms. Yellen. Because no new information regarding rate hikes was provided yesterday nor today, investors are slowly but surely becoming convinced that rate hikes might not end up taking place until sometime next year. Because of this growing belief, precious metals spot values were able to gain a little bit today. As we look ahead to the final few days of the week, you can bet that things will remain just as quiet as they have been through the first half of this week. With that being said, however, there are a few month-end pieces of economic data expected to be made public from the United States. In addition to this, investors will be awaiting the release of the weekly jobless claims report as weekly claims for unemployment benefits have been on the rise for the better part of the past month or more. If that does not turn around soon, we have may investors questioning the actual strength of the US employment sector. This entry was posted in Market Updates on February 26, 2015 by bscom. Gold and silver spot values gained nicely on a day where very few events caught headlines. In fact, this week has been, for the most part, pretty slow and devoid of any major economic developments. Of course, this is all besides the fact that a few major central banks made some policy moves that sort of took the market by surprise. As we look ahead to the last few days of the week, the market will almost inevitably turn its attention to the release of the US employment report for the month of January. The US employment situation has long been at the center of attention for investors, and this time will be no different. As we move forward into this year, the employment situation in the US will remain under the microscope as many analysts are eager to find out if wage growth will improve at all this year. Last year, despite a falling unemployment rate, wages across the board did not really budge. Under ideal economic conditions, wages should increase by considerable margins periodically. Until that happens, it is very difficult to call the US a top-performing economy. On Tuesday, it was reported that the Australian Central Bank was reducing its interest rates in an effort to spur along the economy. This news was surprising and almost immediately saw the AUD fall to a 5.5 year low against the Dollar. This move adds to ongoing currency wars that are currently unfolding across the globe. For gold and silver, continued currency wars are a good thing simply because of the level of uncertainty they create for investors. With that said, however, should the US Dollar continue to benefit from currency wars, upside may be limited for gold and silver. For now, however, metals continue to benefit from the wide array of moves being made by central banks. In the early morning hours of today, it was reported that China decided to reduce its reserve requirement ratio for domestic banks. This move was also made in an effort to stimulate the Chinese economy which has been falling behind for the better part of the last 12 months. For precious metals, this was good news as China is the world’s largest importer of raw commodities. As time moves on, it will be interesting to see how the past two days’ moves affect the economies in question. In all reality, they can’t make things too much worse than they already are. This entry was posted in Market Updates on February 5, 2015 by bscom. Gold and silver are starting of the middle day of the week in less than impressive fashion, having conceded some of the gains that were made on Tuesday. This week, despite being filled with activity, is shaping up to be quieter than the last few. For precious metals, we have not seen prices move too far in any one direction. On Monday, gold and silver opened up with losses, but by Tuesday those losses were reverted and small gains were posted. Hopefully, with volatility present in global equity markets, precious metals will derive a bit more support from safe-haven demand. In case you missed it, last week saw the European Central Bank finally announce their plans to institute quantitative easing to the region. While this announcement did not come as a surprise, the fact that the EU’s QE plans include 60 billion euros worth of purchases each month did catch some investors off guard. Of course, QE measures will not be introduced until sometime in early 2016. Between then and now, however, it will be interesting to see how the EU fares from economic and financial standpoints. Because the 4th quarter of any year includes the busy holiday season, investors from around the world expect that 4th-quarter earnings reports will be some of the best. Unfortunately, however, yesterday’s batch of corporate earnings reports disappointed those who mulled over them. Caterpillar posted some particularly poor earnings and blamed a slowdown in the mining industry as a major reason behind why orders for construction equipment have dropped off significantly. Proctor & Gamble also reported poor earnings for 2014’s fourth-quarter. P&G cited a stronger US Dollar as reason why overseas earnings were far weaker than expected. These poor earnings reports ended up taking a toll on US equities as the Dow posted its biggest single day losses since October. In recent weeks, stocks in the US and elsewhere around the world have experienced a lot of volatility and this is causing investors to become particularly nervous. For that reason, interest in safe-haven precious metals has spiked recently and has seen spot values increase dramatically after the last two or three weeks. As we move forward into the month of February, it will be interesting to see if gold and silver are able to retain their lofty positions or if spot values will be brought back downward. This entry was posted in Market Updates on January 28, 2015 by bscom. Gold and silver spot values are moving forward yet again today, fueled mostly by investor uncertainty ahead of this week’s European Central Bank meeting. Now, both gold and silver spot values are sitting above key points of technical resistance and are sitting at near 6-month highs. This week is activity-filled simply because of the sheer quantity of economic data and economic happenings taking place, but apart from the ECB meeting, there aren’t many factors that are able to stop gains being made by gold and silver. For the better part of the last few weeks, the global marketplace has been almost fully focused on the European Union. Though the ECB meeting is part of the reason behind why investors are so worried about the EU, there have really been almost non-stop news stories coming from the region. This week is seeing much of the same play out as investors once again cannot take their attention away from the EU. Like was made painfully clear in the opening of this piece, the eyes of the investing world have been wholly fixated on Europe for the better part of the past two or three weeks. Last week saw quite a few news stories originate from the EU, including a surprise move by the Swiss National Bank to unpeg the Franc from the Euro. This move was unexpected by the wider marketplace and sent a shockwave across the spectrum of global investors which, in turn, caused interest in safe-haven gold and silver to spike. In addition to this, last week also saw the European Court of Justice rule that the ECB is legally allowed to explore experimental monetary policies so long as they are fully explained before being enacted. Furthermore, the ECJ also ruled that the ECB’s proposed quantitative easing plans are within the realm of the law. This ruling more or less solidified the overriding belief that the ECB was going to announce a monetary policy shift at their meeting this week. While the marketplace is quiet today as investors gear up for tomorrow, there is still a lot of price action to speak of. For one, US stocks are once again conceding value after making impressive strides forward the last few days. With such volatility persisting in global equity markets, it is really no wonder that investors are becoming so much more interested in precious metals. Now, as the weeks move forward, it will be interesting to see if gold and silver can hold or possibly even build upon the gains made recently. This entry was posted in Market Updates on January 21, 2015 by bscom. Precious metals are posting mixed results as of the writing of this post Wednesday afternoon, but have spent the early parts of this week making gains. Metals have done so well simply because investors are growing increasingly worried about the progress, or lack thereof, of the global economy. Recently, pieces of economic data as well as the performance of equities has come into question, and this uncertainty has driven a large number of investors to safe-haven gold and silver. This week has brought about a good amount of economic data, and is expected to continue doing just that. Much to the dismay of investors, however, most of this data has been sub-par in nature and is only making the overall outlook on stocks that much bleaker. This, of course, is upbeat news for precious metals. As we head further into this week, it will be interesting to see if gold and silver can retain and possibly even build upon today’s gains, or if profit-taking and/or a corrective pullback will push spot values back downward. US equities have not fared well at all this week, and thanks to a new retail sales report will likely do even worse. According to the most recent US retail sales report, retail sales in the United States fell in December by .9% on an annualized basis. This report was unexpected simply because December is a holiday month where a lot of shopping happens. Making matters even worse for equities is the fact that crude oil continues to hover near multi-year lows. Now hovering around a 6-year low, crude oil is beginning to really drag on equities, and particularly energy shares. In fact, stock indexes are doing particularly poor all over the world, not just in the United States. Because of this recently poor performance on the part of equities, we are seeing investors more readily flee to safe-haven assets like gold and silver as a means of protecting their wealth. As this year moves on, it will be interesting to see how equities perform and how their performance relates to gold and silver spot values. For now, the downward movement of equities has come to the aid of precious metals and has helped them kick this week off in impressive fashion. Now, the attention of the marketplace is beginning to shift to next week’s ECB meeting, when investors are expecting to hear more information regarding the future of monetary policy across the EU. This entry was posted in Market Updates on January 14, 2015 by bscom. As of the writing of this post early Wednesday morning, both gold and silver spot values were conceding marginal value. After two consecutive days of gains to start this week off, some profit-taking losses should really come as no surprise. Also beating gold and silver down today is a stronger US Dollar. The theme of this week has been and will continue to be the overwhelming amount of economic data that is being made public from the final month of 2014. So far we have received a number of data points from both the US and the European Union, but very few of them have had any major impact on the global marketplace. What has caught the attention of investors, however, has been the downward trend of most major global equity markets. Especially for stocks in the US and Europe, the last few days have been extremely poor. In all honesty, the poor performance of global stocks has been a major contributing factor to the gains made by precious metals over the last few days. A theme in the marketplace over the last few months has been the downward trend of crude oil. The black gold has been beaten down due to there being so much of a supply to satisfy a demand that really hasn’t changed much. Earlier this week, on Monday, the value of a barrel of crude oil dipped below $50 and this alone sent the marketplace into a bit of a shock. The price of crude oil has remained under $50/barrel and because of this, energy stocks have suffered considerably. It isn’t just energy stocks that are feeling the brunt of declining crude oil prices either, because most major global equity markets have been in the red through the first half of this week. The reason for this is due to the growing belief that subdued crude oil prices will lead to severe price deflation across the world. Because of these and other economic concerns, safe-haven demand for metals has been on the up and up through the first 2 and a half days of this week. As we look ahead to the next few weeks, we will be dealing with both an influx of economic data as well as a few central bank meetings. Most notable of these events is undoubtedly the upcoming European Central Bank meeting. The reason investors are so concerned with the ECB meeting is due to the simple fact that they believe a monetary policy shift will be announced. As it stands, the market is expecting to hear of a bond-buying initiative to be put into action in the near future. Just the thought of this announcement has caused the Euro to depreciate this week, and so long as this commonly held belief remains, the Euro will have trouble recovering any of those losses. This, of course, is great for the US Dollar, which has been making gains against a number of rival currencies since the end of last week. This entry was posted in Market Updates on January 7, 2015 by bscom. Precious metals are trending downward today, but losses are being mitigated thanks to a weekly jobless claims report that saw more people in the US file for unemployment benefits. Other than that one report, however, there really hasn’t been too much in the way of economic data for investors to focus on. Like last week, this one is also a holiday week and sees the New Year’s Day holiday fall on Thursday. As a result of this, things have been generally quiet and market activity is light. As we bring 2014 to a close, it is only right that we reflect on what the last 12 months have brought about. For gold and silver, 2014 was a a year to forget. But for the US economy, the last 12 months have brought about a good amount of growth as the US economy is now the world’s top-performer. Unfortunately, so long as the US economy continues to perform well, it will likely mean bad news for the precious metals market. For yet another day, US stocks as well as the US Dollar have been adding value at every turn. For gold and silver, this is bad news simply because investors are so bullish on stocks that they have almost completely lost interest in metals. In this bearish market, gold and silver will have a tough time making gains and an even tougher time retaining those gains. Just yesterday, metals added significant value, but by the time things were all said and done on Wednesday, most of that value had been conceded. As surprising as it may seem, a sub-par weekly jobless claims report released today was not even enough to derail stocks nor the US Dollar. According to the report, this past week saw just shy of 300,000 people file for unemployment benefits. With almost 20,000 more people filing last week than the week before, this report is definitely something worth paying attention to. With that said, however, the United States employment sector has been performing well as of late so I do not think today’s weekly jobless claims will have any major impact on the market. Looking ahead to the rest of the week, it is likely that things will remain quiet simply because investors are holding their positions until we receive year-end economic data over the course of the next few weeks. This entry was posted in Market Updates on December 31, 2014 by bscom. Precious metals have not moved far from where they opened, but what little movement has taken place has mostly been downward. This week, being the holiday week that it is, is set to bring about almost nothing in the way of economic data, and even less in the way of market activity. A large majority of traders and business people have taken a large majority of the trading week off in order to be with friends and family, so it really isn’t surprising that things have remained this quiet. With that said, however, it is important to mention that even though this week is abbreviated due to the Christmas holiday, we have already been dealt a decent bit of economic data. Unfortunately for gold and silver, that data proved to add pressure and cause losses to pile up. As we look ahead to the rest of this week and the next one, it is likely that things will remain just as quiet as they have been through the first half of today. Not only is it holiday season, the end of the year is fast-approaching, and most investors are content to simply hold their positions and await the dawning of a new year. Though we are soon going to be receiving the 4th-quarter GDP report for the United States, Tuesday brought about a revision from the 3rd-quarter’s report. 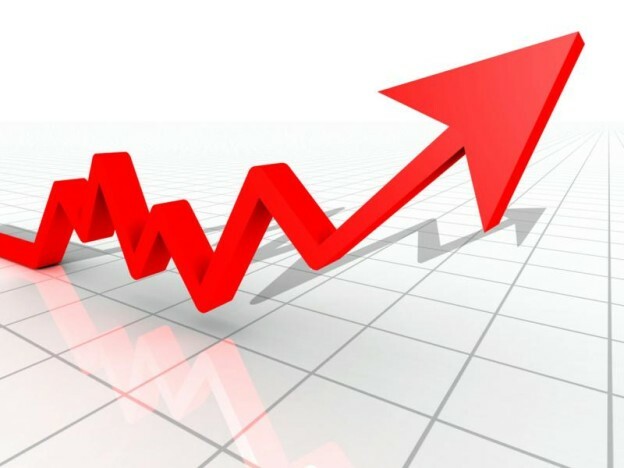 According to the commerce department’s revision, the US economy grew by a solid 5% from July-September of 2014. The report released yesterday saw the GDP figure updated from a previous reading of over 3% annualized growth. As you could have probably guessed, this revision allowed stock markets in the US as well as the US Dollar to make nice moves upward. Japanese and European stocks followed the lead of those from the US and also had a a good, solid start to this abbreviated week of holiday trading. Despite worries regarding a possible global economic slowdown spreading like wildfire only a week or so ago, the market now seems confident that global economy is not in such poor shape after all. For gold and silver, the renewed interest in stock investments is nothing short of disastrous. This is so because as investors become more interested in taking risks on the stock markets of the world, their interest in safe-haven gold and silver will, and is, diminish(ing) rapidly. For this reason, the plentiful batches of economic data that help us ring in the New Year will undoubtedly shape the near-term future of gold and silver’s price charts. This entry was posted in Market Updates on December 24, 2014 by bscom. The spot values of gold and silver are making small gains as of the writing of this post early Wednesday, something that is surprising when you consider the fact that most investors are simply holding their positions ahead of the conclusion of the FOMC’s latest meeting. Up to this point, this week has seen gold and silver lose much of the value, if not all of the value, that was gained during the early parts of last week. Unfortunately, the safe-haven demand that was driving physical purchases of gold and silver a week ago is no longer present in the marketplace. In addition to continued focus on the FOMC meeting, investors are also concerning themselves with what is going on in Russia. Over the course of the past year, the Russian ruble has lost more than 50% of its value and is currently sitting at multi-year lows against the USD. During the last few days, the ruble has seemingly been in free-fall and is looking weaker than ever. According to most experts, the ruble’s current weak trend is the direct result of Western economic sanctions and the fact that the price of crude oil has been trading down for the better part of the past two months. Though it isn’t the biggest concern for investors, everyone is keeping their eyes on the Russian economy and government. As of now, the overriding fear is that a military-minded Putin may lash out at the Western nations who are, for all intents and purposes, causing Russia’s current economic decline. For this reason and many more, you can expect continued attention to be paid to Russia over the course of the next few weeks and months. Typically, the week of the FOMC’s monthly meeting sees most of the market’s attention go directly towards what the FOMC will say and do during their meeting. More often than not, all of this attention is misplaced simply because the FOMC rarely makes major policy shifts. Despite the fact that there is always speculation concerning a potential shift in policy, it rarely ever actually comes to fruition. Just like every other time, this week’s meeting is at the center of a boatload of speculation regarding interest rate hikes. Now you see, interest rate hikes have become something that is more or less an expectation after the FOMC announced that such rate hikes were a possibility during the late summer months. At this week’s meeting, it is the overriding belief of the marketplace that the FOMC will make some sort of announcement regarding when and by how much interest rates will be raised. Though there is no credible source able to confirm this, the rumor is spreading like wildfire. Upon the conclusion of the FOMC meeting this afternoon, the market will convene on the post-meeting press conference that is expected to be held. It is at this press conference that investors think an interest rate decision will be made. For gold and silver, there is no saying what a solid timeline for the raising of interest rates could mean, but most indications are pointing to it being not good news at all. Still, we will just have to stay tuned to what the FOMC has to say to find out. This entry was posted in Market Updates on December 17, 2014 by bscom. Gold and silver spot values are reeling a little bit on Wednesday, but after two days of solid gains, most investors will take it. The first two days of this week saw gold and silver make significant gains, and because of that, most people anticipated that the losses from profit-taking would pile up today. Much to the surprise of everyone, however, gold and silver spot values are continuing to improve on Wednesday, albeit by slim margins. This week is not going to play host to too much economic data, but there will be plenty of market factors for investors to pour over and discuss. In addition to continued attention being paid to the crude oil market, investors will also be interested to see what direction global equities head in as we venture deeper into the week. Up to this point, however, global equity markets have had a tough go of things through the first few days of the week. For the last month or more, crude oil has been in and out of the headlines due to its recent price action. For more or less the past month, crude oil has been slumping and losing a good amount of value. There are quite a few reasons for this, but out of all those reasons, none is more pervasive than the fact that the supply of crude oil is significantly more abundant than it was only a few months ago. You see, the United States has really increased their output of crude oil in recent months, and it is finally having an impact on the global market. Because of the increased amount of US crude oil in the global supply, it only makes sense that prices are moving downward. In addition to there just being more oil on the market, the absence of a war premium is really helping things. A war premium, for those who may not know, is an added 10%-25% on top of the cost of oil due to the fact that it was extracted from a war torn part of the world (ie the Middle East). It will be interesting to see, over the next few days and weeks, if crude oil will bounce back, or if the price will remain near 5-year lows. Up until this week, slumping crude oil brought the value of gold and silver down with it, but that has all changed due to a dimming outlook on global economic growth. So long as people are still worried about the global economy, safe-haven demand for gold and silver will likely be enough to keep spot values propped up. This entry was posted in Market Updates on December 10, 2014 by bscom.